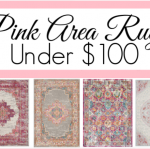 Pink Cottage Bedroom Ideas to help you create a soft feminine space in your home! 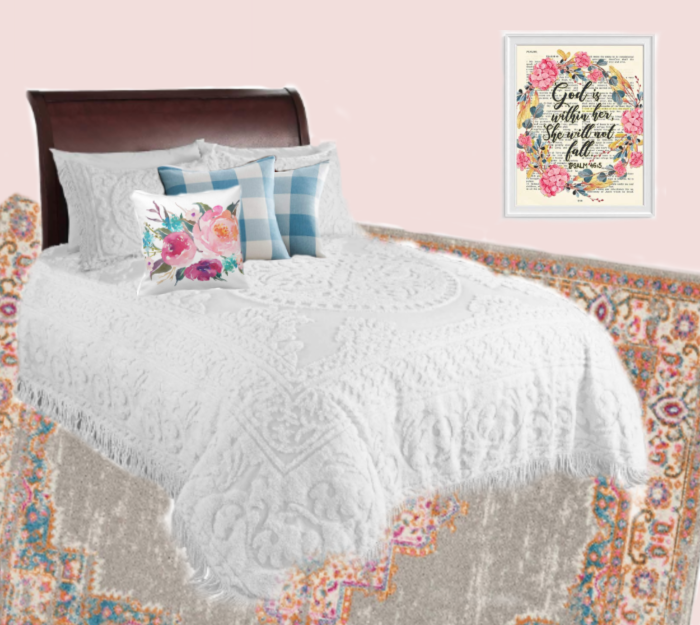 Cottage style bedroom inspiration with soft pink wall color, floral artwork, and an inexpensive pink area rug. 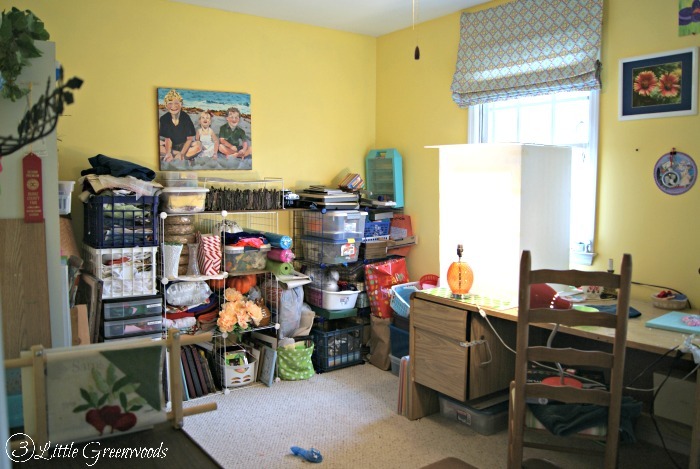 This is my junk/craft room. Quite a sight, isn’t it? For months I would quickly sneak by this room without peeking inside. All the craft clutter, half finished projects, and thrift store junk was really getting under my skin. Instead of shutting the door and blocking out the mess I decided to completely purge the space and start over from scratch. Wall Color: The bright sunshine yellow has got to go! 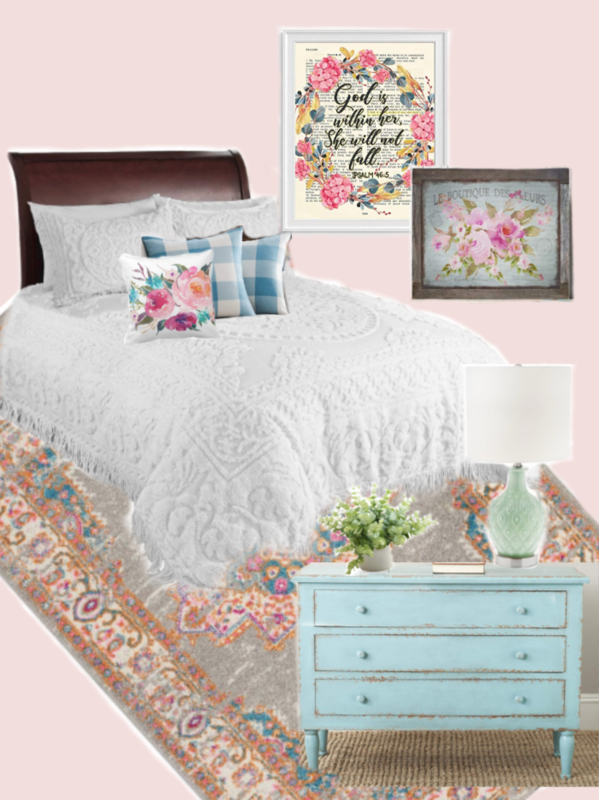 A soft pink will be the perfect starting point for this cottage bedroom makeover. The Bed: Well… we don’t exactly have one of those yet but I’m working on a low cost/free solution. Hopefully I will be able to find a family hand-me-downs for both the bed and bedding. 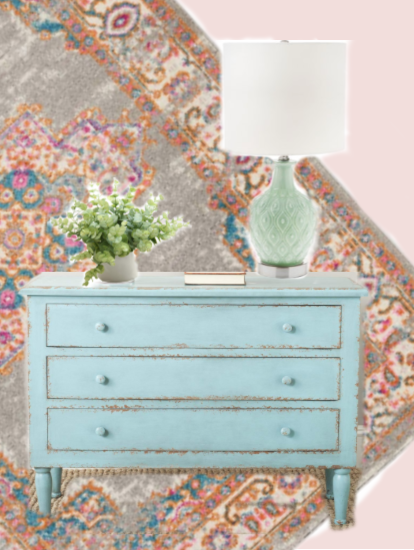 Rug: I cannot wait to find just the right rug for this room. It needs to be pink but not P-I-N-K (if you know what I mean). Maybe something a little funky to mix up the cottage bedroom ideas. Bedside Table: Crossing my fingers this problem can be solved with a little game of Musical Tables. Between the living room, dining room, and bedroom there should be an extra table that can be used as a bedside table. I love the look of this little blue table. 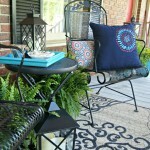 Pair it with a new lamp and small green plant and it should be perfect! 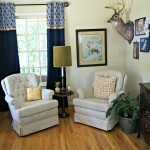 Window Treatments: Since this bedroom will host overnight guests I will need to beef up the window treatments. Blinds for privacy are a must. And something a little fancier up top! 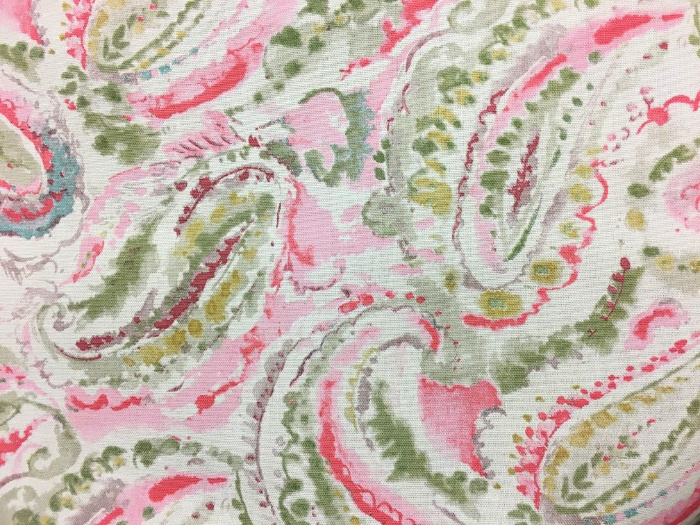 Like maybe this fabric… it would fit right in with the pink cottage bedroom decor. 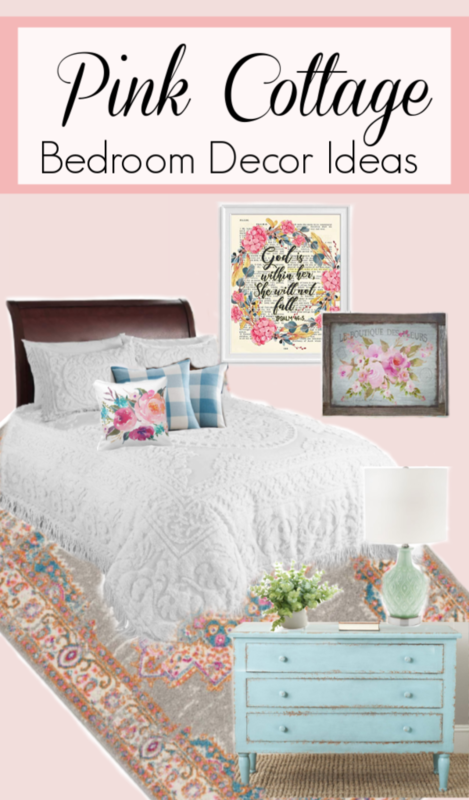 Floral Artwork for Cheap: A list of cottage bedroom ideas won’t be complete without beautiful floral artwork for the walls! 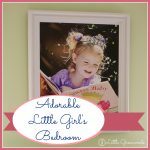 Hopefully, I’ll be able to find a couple of free printables. 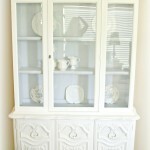 If not then there are lots of great pieces of cottage home decor on Amazon to choose from. 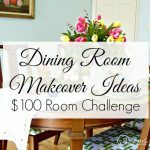 Just like every room makeover I tackle there is a tight budget that I will need to stick to. This time it’s $500 dollars to turn my craft/junk room into a perfect guest bedroom with lots of pink cottage bedroom ideas. Make sure to stick around to see all the progress!